Relatives of one of those killed in the shooting console each other in Juarez on Sunday. (CNN) -- As many as 15 gunmen stormed into a house party in Juarez, Mexico, in the early hours of Sunday morning and opened fire, killing at least 13 people and injuring 13 others in one of the deadliest attacks the city has seen this year, a police official said. 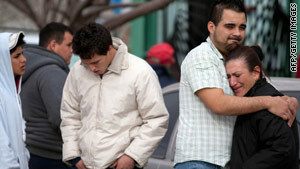 The shooting happened around 12:30 a.m. in southern Juarez, police spokesman Jacinto Seguro told CNN. "Witnesses said the gunmen arrived in seven cars, closing down the streets and blocking exits," Seguro said. "They then stormed into the party and began shooting as the group was watching a soccer game," he said, adding that windshields and windows on the cars were darkly tinted. The victims' ages were between 14 and 19, Seguro said. No other information about the victims was immediately available. "We're still trying to establish a motive," Seguro said. More than 100 AK-47 bullet casings were found around the crime scene, Seguro said. The AK-47 -- known in Mexico by its slang name of "cuerno de chivos," meaning "goat's horn," in reference to the gun's banana-shaped clip -- is the weapon of choice for drug cartels. On Friday, at least seven bullet-riddled bodies were found scattered throughout northern Juarez, according to police. Recently, there had been a relative downturn in violence in the city across the border from El Paso, Texas, with a reported ceasefire between two rival cartels battling for rights to the critical Juarez drug route into the United States. The reported ceasefire between the Sinaloa Cartel and the Vicente Carrillo Fuentes Cartel, commonly known as the Juarez Cartel, was expected to last until February 28, according to a local source who covers the conflict between the two cartels. At least 160 people have been killed in Juarez since the start of the year, according to local reports.